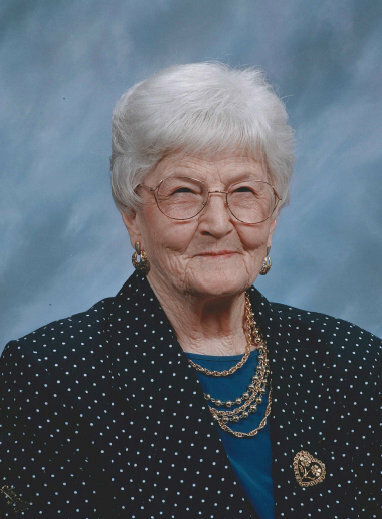 Funeral services for Hermione “Helen” Dixon, 101, West Plains, Missouri, will be held at 2:00 p.m., Wednesday, April 10, 2019 at First Church of God, under the direction of Robertson-Drago Funeral Home. Mrs. Dixon passed away at 11:26 a.m., Friday, April 5, 2019 at West Vue Nursing Center. She was born November 25, 1917, at Marionville, Missouri, to William Arthur Kerr and Ethel Malinda Johnson Kerr. On June 4, 1941, she was married at Sioux City, Nebraska, to Oscar Henry Dixon, who preceded her in death on June 25, 1996. To this union three children were born. She attended Billings High School, graduating in 1937, then off to Springfield Normal School, now known as Missouri State University, Springfield and Drury University. Mrs. Dixon taught in many rural schools around West Plains and finished her 50 year career at Fairview School. She accepted Jesus Christ as her Lord and Savior at an early age and was a lifetime member of First Church of God, West Plains, Missouri. She is survived by three children, Charlotte Cochran and husband, David, Ronald Dixon and wife, Olivia and George Dixon and wife, Patricia; six grandchildren, Cynthia Eubanks, David L. Cochran, Ronald Dixon, Jr., Keith Dixon, Coreena Butts and Johnny L. Dixon; nine great-grandchildren, Emily Cochran, Connor Cochran, Zachary Dixon, Derrick Dixon, Garrett McKee, Hannah McKee, Courtney Tyler, Minnie Mason Dixon and Alexa Dixon; three great-great-grandchildren, Rylee Tyler, Adelyn McKee and Luke McKee; two brothers, Kenneth Kerr and Wendell Kerr; and many nieces and nephews. Her parents, husband and nine siblings, Linda Lupardus, Maybelle Atkisson, Coble Kerr, Raymond Kerr, Ruth Harvey, Raleigh Kerr, Evelyn Wingett, Celista Vogt and John Kerr, preceded her in death. Visitation will be held from 6:00 until 7:00 p.m., Tuesday, at Robertson-Drago Funeral Home. Burial will be in the Union Hill Cemetery. Memorial contributions may be made to Union Hill Cemetery or Dolly Parton’s Imagination Library and may be left at Robertson-Drago Funeral Home. Our deepest sympathy to all of you upon the loss of Helen. All of you will be in our daily prayers and thoughts. May God comfort, encourage, and support each one of you thru this difficult time. May God bless all of you. I will Always have wonderful memories of Helen from the neighborhood and her caring attitude and support of Corby too. So sorry for the lose of your loved one. My Sympathy goes out to all the family of Helen. She will be missed. And we know that she is in the arms of Jesus. Love and Prayers during this time of sorrow. Sweet memories of my childhood were sitting on the front porch with Oscar and Helen and visiting. Helen always “bought” our little neighborhood “paper” that Amber and I wrote. I always enjoyed her laughter and willingness to talk to us, no matter what she was doing. So many memories, including playing Hot Wheels with the grandkids when they visited :). You are in my prayers.